Fire gave us power. Farming made us hungry for more. Money gave us purpose. Science made us deadly. 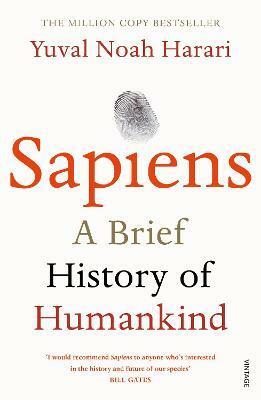 This is the thrilling account of our extraordinary history - from insignificant apes to rulers of the world. Earth is 4.5 billion years old. In just a fraction of that time, one species among countless others has conquered it: us. In this bold and provocative book, Yuval Noah Harari explores who we are, how we got here and where we're going. 100,000 years ago, at least six human species inhabited the earth. Today there is just one. Us. Homo sapiens. How did our species succeed in the battle for dominance? And what will our world be like in the millennia to come? Bold, wide-ranging and provocative, SAPIENS challenges everything we thought we knew about being human: our thoughts, our actions, our power ... and our future. Dr Yuval Noah Harari has a PhD in History from the University of Oxford and now lectures at the Hebrew University of Jerusalem, specialising in World History. Sapiens: A Brief History of Humankind has become an international phenomenon attracting a legion of fans from Bill Gates and Barack Obama to Chris Evans and Jarvis Cocker, and is published in over 45 languages worldwide. It was a Sunday Times Number One bestseller and was in the Top Ten for over nine months in paperback. His follow-up to Sapiens, Homo Deus: A Brief History of Tomorrow was also a Top Ten Bestseller and was described by the Guardian as `even more readable, even more important, than his excellent Sapiens'.